Being able to bring the right tool for the job is of utmost importance when a hunter’s paycheck—and life—is on the line. 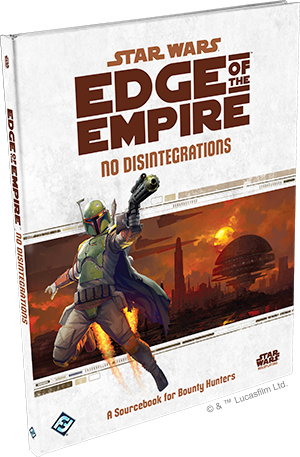 No Disintegrations expands your arsenal for your Star Wars™: Edge of the Empire™ campaign in new and explosive ways. Bounty Hunters who require that their quarry be returned breathing (or merely ‘alive’ in the case of non-respiratory species) may find great utility in the “Precision-X” marksman rifle, which features an extended range for its powerful stun setting; or the “Subduer-9” riot blaster’s short range of devastating stun damage. For more heavy duty non-lethal requirements, the Nova Design “Impact” repulsor cannon weaponizes the repulsorlift technology that powers speeders all over the galaxy for brutal, debilitating blasts that can quell even the most persistent adversary. For the hunter more inclined to exceptional violence, No Disintegrations offers a range of purpose-built micro-rockets such as those fitted with Ion, Incendiary, or Explosive warheads. Fired from a special launcher pistol or from attachments available for ranged weapons or armor, micro-rockets give the user a variety of options for fully stretching the bounds of collateral damage allowed in the contract. Accomplished hunters may even wish to adorn themselves with the battle armor of the fabled and feared Mandalorians. Owing to their impressive quality and legendary status, most warriors would be loathe to part with a set, and so locating and acquiring Mandalorian armor often makes for a thrilling challenge in its own right. The rewards that hunters may reap can go beyond credits or material goods. No Disintegrations introduces the Exploits reward system as a new way for Bounty Hunters to ensure their fame—or infamy. After completing a sufficiently difficult contract or otherwise impressive feat, the Game Master may reward the Bounty Hunter with appropriate Exploits that provide bonuses on future jobs. These include increased credit payment or improved dice pools on social checks when engaging similar targets in the future. Simply surviving long enough in this career can easily turn even a merely competent hunter into a mythical figure in the galactic underworld. No Disintegrations also provides players and GMs with a framework for what it means to be the hired enforcers of a dangerous galaxy. 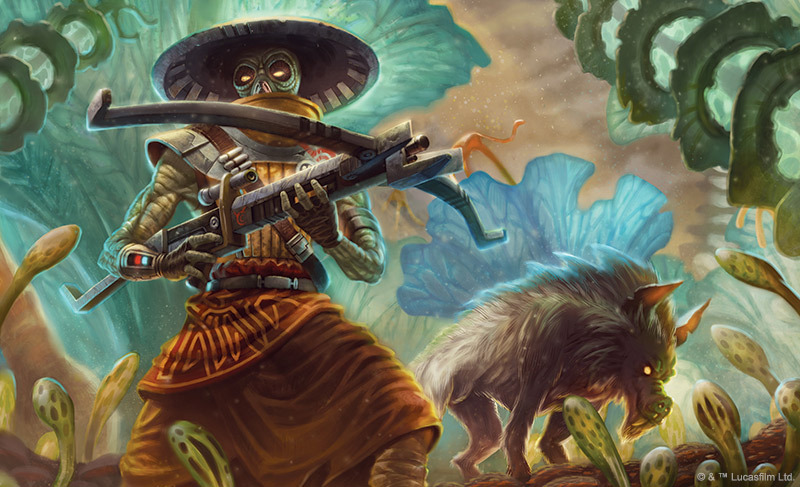 This focuses around player choice, and prompting the Bounty Hunter players to make some important decisions regarding the business of hunting sentients. Is the character a member of a guild, or are they freelance? Guild members may have an easier time finding and taking on new contracts, but their superiors are always going to want a cut of the reward. Additionally, GMs can use player choice to design campaign hooks to help bring everyone in the group into the story. If guilded, how does the guild treat the non-hunters in the party? If freelance, who does the hunter turn to when misfortune visits? 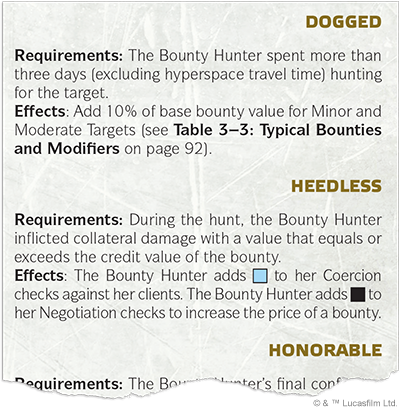 These decisions are perfect for highlighting the scope and type of Obligation for the Bounty Hunter character and can inspire some critical story moments. In addition to strengthened character creation ideas, No Disintegrations also has much to offer GMs as they design scenes, sessions, and entire campaigns. Central to this is the wealth of guidelines, tables, and examples for running investigations—as small as immediate encounters to as large as pursuits lasting multiple game sessions. The targets of contracts generally are not going to be found partying at the local cantina (not the lucrative contracts, anyway). Greater difficulty generally means greater pay, and Bounty Hunters are adept at finding those who do not wish to be found. This sourcebook breaks down the essential steps of gathering information, chasing down leads, defeating obstacles, and ultimately bringing the target to profitable justice. This new content isn’t just for building campaigns for Bounty Hunter PCs; industrious GMs will find these suggestions and frameworks useful for making more effective NPC opposition as well. If (or when) the party in an Edge of the Empire™ campaign runs afoul of a powerful Hutt, how will they prepare now that they are the targets of an investigation? A group of people with strange, unexplained powers in a Force and Destiny™ campaign could inadvertently make themselves the contract target of a wealthy benefactor who would like to ‘acquire’ them and their useful abilities. And, of course, the Empire would not hesitate to make contact with a reputable guild to capture an especially problematic Rebel cell in Age of Rebellion™. No Disintegrations will be arriving soon at your local retailer and our online webstore, so make sure to secure your copy today!